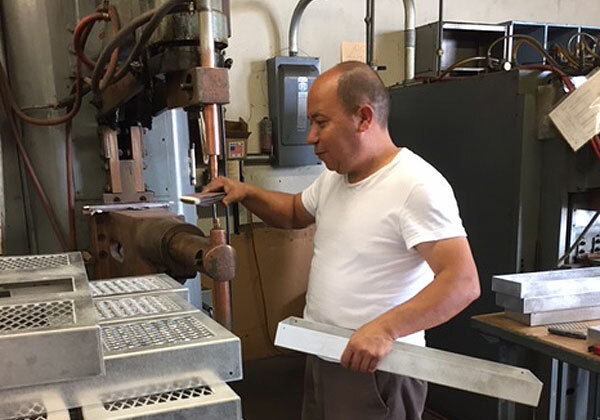 Associated Spot Welders is the best choice for Nadcap-certified spot welding among Los Angeles and Orange County businesses. For over six decades, we have provided exceptional spot welding, stud welding, projection welding, and production welding to thousands of metal fabrication companies, stamping companies, and manufacturing companies in Los Angeles, Long Beach, Santa Clarita, Pomona, Santa Ana, and surrounding areas. We specialize in welding steel, stainless steel, aluminum, and brass, and can create long-lasting, durable welds for a full range of commercial and industrial applications, such as airplane parts, machine components, locks, microphones, and more. With a team of experienced technicians and well-maintained spot welding equipment, we have the capacity to complete spot welding jobs of all sizes, from 100 machine parts for a metal stamping company in Los Angeles, to a full production line of heavy duty locks for an industrial supplier in Torrance. Our reliable welders have over 10 years of experience each, and always use the industry’s best practices and Nadcap-certified welding techniques to achieve exceptional results. When you choose Associated Spot Welders, you can rest assured that we will get the job done on time, in budget, and in accordance with your exact specifications. Contact us today for your next spot welding order. Give us a call or stop by our workshop in the City of Industry during the hours of 6:00am - 2:30pm, Monday through Friday. We offer convenient will call drop-off and pick-up services during normal business hours, and can also receive orders and arrange return shipping for companies located out of state.